With the approach of developing a travelling vehicle, well integrating all additional functionalities is a make-or-break issue. 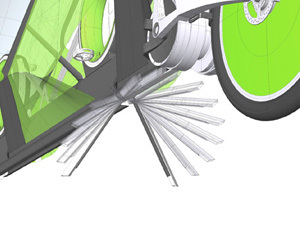 With the Läufer, a mechatronic vehicle stand, an intelligent lighting system, a wind shield washing system, a baggage system and various fairing parts have been developed to also be equivalent to the Läufers innovative drivetrain. With all components, students aim to seamlessly integrate them into the Läufer design. Finally a travelling bicycle without a bunch of hose clips, tape and wire straps.